Born in 1977, Greg West grew up in Daytona Beach, Florida, with a passion for music. He dedicated his teenage years to guitar lessons, and then voice training in his early twenties. After many years of growth and accolades playing the local music circuit, Greg moved to Nashville in 2007 to pursue his dreams in the music industry. It wasn’t long before he began getting double-takes due is his resemblance to country music star, Jason Aldean. Flattered and intrigued, Greg began to study the music and performance styles of Jason, developing such an impressive likeness that in 2013, he was hired by “Country Superstars” on the Las Vegas strip to perform in their show as Jason Aldean. 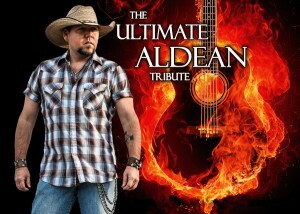 His performance was so spot-on that Greg decided to tour the nation with his own Jason Aldean Tribute show. By 2015, Greg had his talented Nashville band together and has performed over 50 shows nationwide from Maine to Florida to California, at fairs, casinos and clubs. “The Ultimate Aldean Experience” is a full blown, high energy, live show that is hailed to be the closest you can get to a Jason Aldean concert, without Mr. Aldean himself!